NEW! | Book – Get a free copy now. Creating value: Six questions that establish value in every sales and leadership conversation. Your Critical Executive Question: What Metric Must You Move Now? Every week get a short, pithy article on Executive Strategy Skills™. All fields are required. You’ll get an email with a link to verify and confirm your enrollment. Leadership isn’t just the ability to attract and direct good people, it’s the intention and skills required to operate a sustainable, scalable, profitable operation. 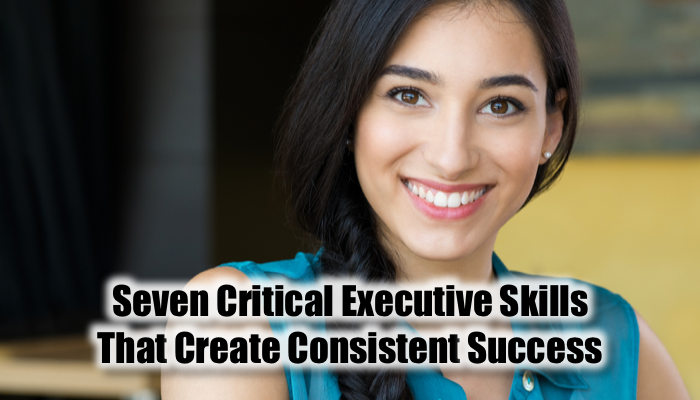 In my working with executives of all types over the past three decades, I’ve identified seven skills required for sustainable and scalable success. When one skill is weak or missing, organizational trouble follows, sooner or later. The good news: these skills can be developed and improved. Read on to identify if you have these skills and to assess where you need to expand and develop them. They are presented in roughly the order of importance. Presence is that certain something that attracts people, commands their attention, and permits a leader to engage. Presence is the ultimate in first impressions. Without it, you don’t even get a chance to lead, even when you have a position of authority. Presence is a powerful combination of emotional intelligence (EQ) plus integrity that creates charismatic leadership. According to emotional intelligence researchers, 70% of your success as an executive is because of your EQ and 30% because of your mental capacity (IQ). Emotional intelligence is the ability to balance your awareness and management of yourself, others, and things. When you’re unaware of others, you’re a narcissist. When you’re unaware of things, you’re a minimalist. When you’re unaware of yourself, you’re an altruist. A successful executive must balance your awareness. Another way of considering self awareness versus the awareness of others is the concept of humility. Jim Collins in his classic work, Good to Great identified that humble leaders were the common theme. Yet, humility is widely misunderstood because of an adjacent, but completely different word, humiliated. Without integrity, you’re doomed. Once your people discover you’re not of your word, the game is over. Ask yourself: On a scale of one to 10, how is your ability to balance your awareness? Which awareness requires attention? While we’d love to be free spirits, unbound by convention and routine, that doesn’t work for an executive. Discipline requires personal and professional routines. It’s within that structure that we truly find freedom to focus on the variables that executives manage and direct. For example, Steve Jobs, arguably one of the most effective leaders, wore a uniform of black mock turtleneck, blue jeans, and New Balance sneakers. This meant he had one less thing to think about. He also had a meditation practice that kept him centered and effective. Without a personal routine, you’ll skip meals, not get enough sleep, and not get the exercise you need, all of which contribute to your most valuable resource, your cognitive capacity. Without an executive routine, you’ll fight fires all day long and never attend to the critical strategy, prioritization, and culture maintenance that is the hallmark of an effective executive. Ask yourself: Does your daily routine support you for being your most resourceful? Does your executive routine ensure that every aspect of your business gets attention, especially strategy and culture alignment? When was the last time you did a future vision exercise? If it wasn’t within the past thirty days, you may face a looming disaster and don’t yet see it. Why? Because, as Scott Adams puts it, “Goal thinkers only see what’s between them and the goal line. Systems thinkers avoid slow moving problems.” Scott points out the difference between being tactical, working to the goal, and being strategic, creating a system that generates goals. Foresight is how we engineer our systems that generate value for our constituents. We must be looking forward beyond their horizon if we are to deliver value that’s consistent, sustainable, and scalable. Ask yourself: What is your vision horizon? If it’s not at least three years out, you’re on a downward path. When was the last time you revisited your vision? If it’s not in the last thirty days, you’re developing a blind spot. Most leaders have a strong skill set around one area of business acumen, may it be sales, marketing, operations, or knowledge base. Few are well versed in every area of business and so tend to abdicate responsibility to others for their lack, without knowing how to select, direct, and manage those functions. The result is almost always disaster. Yes, even I have fallen into this trap and almost tanked my organization because of it. A successful executive understands and directs the elements of business, in both strategy and tactics and refuses to abdicate responsibility because of a lack of understanding, instead investing in knowing what’s required and why, without necessarily knowing all the details of how it’s accomplished. Let’s explore branding for a moment. Branding is not your logo, color palate, or any other design element. That they’ll tell others about. Can you clearly articulate your brand? Ask yourself: On a scale of one to 10, how proficient are you at each of the seven business pillars? Where do you need to improve your acumen? How can you get tutoring in the elements of that pillar? A successful executive must be able to communicate ideas and actions clearly, aligned with how their audience is receiving communication, and judiciously use humor. I’ve found that most teamwork issues are rooted in lack of communication skills or the inability to adjust communication styles to the person and task at hand. For example, there are times to be sweeping and general in language, and there are times when a high level of detail is required. Don’t mix up the generality nor the circumstance or you incite boredom or confusion. Each role in your organization requires a different approach to processing information. For example, your treasurer needs to be detail oriented and by the rules, and your marketing team must be flexible and creative. They each require a different approach to communication and conversation. Successful executives take responsibility to communicate in the way that works for the people they’re leading. And it’s often different than their natural way of communication. It’s for this reason that you must choose people you don’t necessarily like to do tasks that you don’t like to do. Ask yourself: How often do you have problems with your team “getting” your message? If it’s more than rarely, it’s time to work on your understanding of how people communicate. To lead, you must persuade others to align their priorities with your priorities. This requires negotiating skills and the ability to create agreement that all involved want to keep. Successful executives know that negotiating ability is both the skills of getting more from their resources as well as being able to resist the demands of those who are out of alignment with the principles of the organization. Ask yourself: How frequently do you find yourself agreeing to things that you really don’t want? How often do you think that you could have gotten more and the other party still be happy? How often do you feel that you could have been more persuasive? If it’s not rare, consider a course in executive negotiation skills or learn persuasion skills. Successful executives are comfortable with uncertainty. They can initiate actions without knowing the complete roadmap because they have a decision-making system that leads to more resourceful decisions than bad decisions. For example, you cross the country at night by seeing only the 300 feet ahead of you illuminated by headlights, never seeing the entire road. You do know your destination, making course corrections along the way. The result is efficient allocation and management of resources, such as time, personal energy, imagination, people, and money. Resourceful decisions are based on a combination of the prior six skills discussed here, plus a decision strategy that effectively considers the elements of the decision. The best executives use a checklist to ensure that the critical elements get considered. You might be thinking, “I use my gut to make decisions.” This isn’t scalable, because you can’t teach others your gut method like you can with a decision checklist. Your gut is the final test, not the only test. Ask yourself: Do you have a decision-making checklist, one that you routinely use and refine? If not, time to build it. Be honest with yourself, as you’re the only person to benefit. Now that you’ve identified where you need to build your executive strengths, put together your personal plan to make it happen. If you want to work on your skills, consider attending Executive Strategy Summit. Specifically for Executives, upgrade your strategic skills and leave with a Monday-ready action plan for your business. Let’s have a conversation about growing your business through strategic planning, marketing plans, executive coaching, and customer acquisition systems. Find a mutually agreeable time at MarksSchedule.com or contact me.